How to Keep Rolling After a Fall by Karole Cozzo, which is fantastic so far. Nikki is such a relatable, complex protagonist, and love interest Pax… all the swoon, guys. I’m loving the premise of this book — the fallout of a terrible cyberbullying incident — and I can’t wait to see how Nikki’s story plays out. I recently listened to Cristina Moracho’s Althea & Oliver, which I reviewed in yesterday’s February Reading Wrap-Up. The condensed version: A gritty story set in the late nineties that made my heart hurt bad. Now, I’m listening to Marie Rutkowski’s The Winner’s Crime (I read the novel last year) in preparation for this month’s release of The Winner’s Kiss. You’ll check out the debut group I belong to, The Swanky Seventeens. We’re growing every day, our members’ books sound fantastic, and we’re currently featuring interviews with 2016 debut authors on our blog. Follow us on Twitter and Facebook, too. Do it! I find that when I write goals down, I’m much more likely to complete them. 🙂 Hope you’re having a lovely week, Cole! Just a few checks, but a good start. 🙂 Have a fantastic week, Leandra! I’m about to start a Winner’s trilogy reread too…can’t believe THE WINNER’S KISS is finally almost here! But first, I’m reading THE WEIGHT OF FEATHERS!!!!! I just started last night and there’s something so intoxicating about the mermaid-swimming/tree-walking performance aspect. So gorgeous so far, thank you again for the rec! I can’t wait to hear about your experience at the NoVaTeen festival. Such a great line-up of authors! I’m dying to hear what you think of FEATHERS, Kaitlin! “Intoxicating” is a perfect word to describe it, I think. I finished listening to THE WINNER’S CRIME this morning and oh-my-gosh it’s just as heartbreaking the second time around. I can’t wait to finish this trilogy, but at the same time, I know I’ll be sad it’s over. The book fest sounds awesome! I’m so jealous! One of the few perks of living in a big city is the book events. 🙂 I hope to blog about the book fest next week — I’m excited! Have a great week, Jennie! Oh your posts make me miss D.C! I’m glad you had a lovely time. I’m going to look up How To Keep Rolling After a Fall as I absolutely loved The Love that Split the World, keep the great recommendations coming Katy! I’m so happy to hear that you loved THE LOVE THAT SPLIT THE WORLD! I’m always hesitant to overhype books, but that one… SO GOOD. 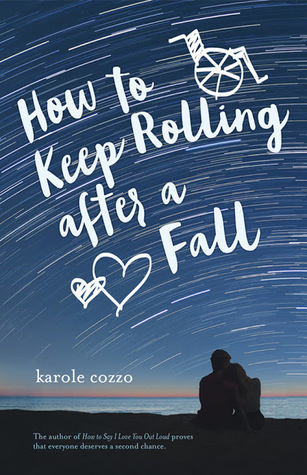 Karole Cozzo’s HOW TO KEEP ROLLING AFTER A FALL comes out this August. I finished it last night and enjoyed it so much! It’s a cross between a Sarah Dessen novel and a Miranda Kenneally novel, I think. 👍 Have an awesome week, Alexa! Hey there! I have been missing in action for awhile, but was pretty excited about the Currently idea. I LOVE your list! I actually have one of those as well. I have a LOT of it checked off already but…I need to revisit and re-prioritize it. Happy Tuesday! Welcome back, Kim! I’m inspired that you’ve got so much checked off your list. Mine feels miles long and very empty of check marks right now, but I know I’ll get there. 🙂 Hope you have a wonderful week! I love that you transformed your 30 Before 35 List to a “Life List.” Have fun at the festival this weekend! !